Blood, Sparrows and Sparrows is the winner of the 2015 Debut-litzer Prize in Poetry. "By the end of the collection, I can’t help feeling the same echoes of devastation and resolve. These are brave poems and a remarkable debut. I look forward to reading more from Leigh. Her words feel important, and they should be read with the care and love that good poems deserve." Read the full review. "Reading Blood, Sparrows and Sparrows reminded me of George Herbert’s assertion that ‘He who cannot forgive breaks the bridge over which he himself of pass.’ Leigh’s poems nakedly envision a world of complicated hope, and in doing so, create a foundation for that bridge of ourselves over which we pass to remain intact, at least for a little longer.” Read the full review. "The mind looks for causes, wants to understand, finds reasons, partially accepts or rejects them. Much of Blood, Sparrows and Sparrows seems to echo this way-seeking journey.” Read the full review. "In Leigh’s world, survival doesn’t mean absolution or release but the ability to create something new. Imagination is a tool for liberation, allowing the speaker and characters throughout the collection to endure; prepared to make something more powerful than the retelling of tragedy, as in the collection’s last line ('The Happy Couple'): 'For now, we sing.'" Read the full review. "These poems are loosely focused on God, father and family -- but it is Leigh's precise weight we enjoy most, regardless of subject. Her voice has weight, resonance, echo and these poems can make you laugh out loud, usually just before Leigh kicks you in the throat." Read the full review. 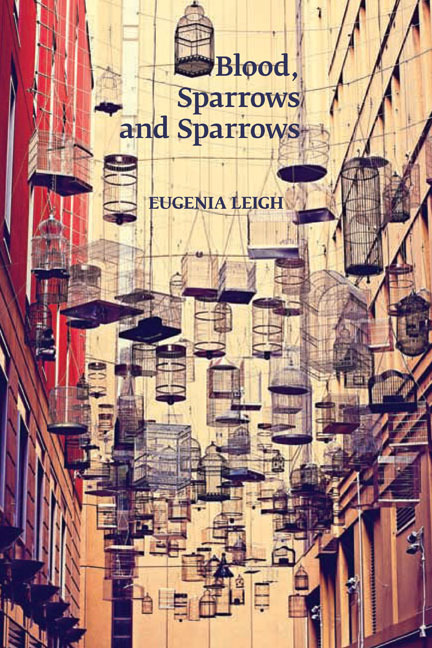 "...throughout Blood, Sparrows and Sparrows—the reader must reckon with the impossibility of unceasing grace in the face of violence, a grace which Leigh captures with a sharp-edged, heart-splitting beauty. She asks us what it means to endure on earth, instead of in the stars, after living trauma that’s determined enough to end us." Read the full review. "The power of Leigh’s work is that she gives her lyric speaker the chance to find strength in remaking wounds into something new, perhaps even beautiful in these twisted reconfigurations. Is this approach not the best a confessional poet can do in the face of such great trauma? This collection is a perfect fit amongst the others I’ve read from Four Way Books; the editors and publishers of the press are well aware of the ways that confessional poets lyrically confront such deep wounds to remind us that the elegance is in how we choose to recover. " -- Asian American Literature Fans Read the full review.